to check out which Monterey County restaurants are offering up delectable traditional Thanksgiving feasts! Need to find a way to keep the relatives busy? 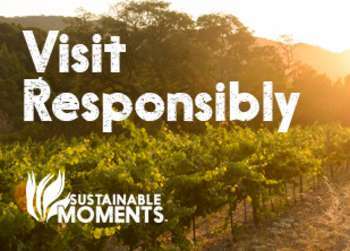 Bring them to Monterey County where there is something for everyone from Grandpa Joe down to your 4 year old niece. Check out what is in store for this holiday weekend and kick off the Christmas season in style! There’s no better way to bring in the holiday season than with a little ice skating by the bay! Custom House Plaza in historic downtown Monterey has transformed into a winter wonderland until January. Monday-Saturday from 11am-10pm and Sunday from 12pm-8pm. 4 Custom House Plaza, Monterey. $12 for adults and $10 for children. Skate rentals are $3. The Museum of Monterey presents a special screening of “The Valley of the Dolls” this Friday at 5pm and Saturday at 2pm. This flashback film is based on Jacqueline Susann’s novel which revolves around a New England college grade who leaves her small town roots for the bright lights of Broadway and Hollywood. 5 Custom House Plaza, Monterey. Free with paid admission. It’s black Friday which means it’s time to start Christmas shopping! Z Folio Gallery on Cannery Row kicks off the shopping season with an Art, Music & Candlelight event. The unique jewelry and décor gallery will be lit up by candlelight and accompanied by live music and light refreshments. 4pm-8pm, 750 Cannery Row, Monterey. Free event. Family still in town? 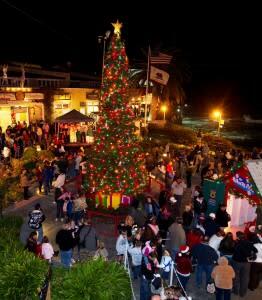 Get them in the festive spirit and bring them to the Cannery Row Tree Lighting today. There will be plenty of family fun activities including visits from balloon artists, Christmas Carolers elves and reindeer. Don’t miss the tree lighting ceremony beginning at 6pm with old Saint Nick! 4:30pm-9pm, Cannery Row, Monterey. Free event. Singer and songwriter Gabriel Gandzjuk heads over to Pierce Ranch Vineyards this evening for an intimate concert. Sip on a glass of vino and enjoy his classy jams! 8:30pm-10:30pm, 499 Wave Street, Monterey $5 cover for those 21 and older. Work off some of that turkey and pumpkin pie this morning with a hike through Snively’s Ridge Post in Garland Ranch. The amazing views of the Pacific Ocean and Carmel Valley will certainly leave you thankful for the beauty in Monterey County. The 4.5 mile hike is expected to take 3-4 hours. Don’t forget to wear good hiking shoes and to bring plenty of water, lunch and snacks. 9am, Garland Visitors Center , Carmel Valley. Free event. Who doesn’t like the scent of lavender? Carmel Valley Ranch hosts a Lavender Craft Fair today featuring works from various artisan and craft vendors. You can also roll up your sleeves and create your own works of art during one of these classes: lavender essential oil distillation, lavender soap making, and lavender holiday ornament making. Classes are $25 for adults and $15 for those 16 and under. Call 831-620-6427 x 247 to reserve a spot. 9am-5pm, 1 Old Ranch Road, Carmel. Free event. Need to get the kids out of the house? 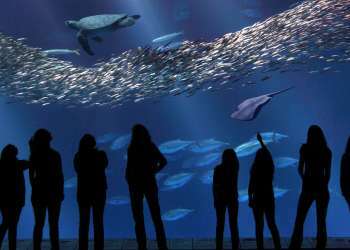 Bring them the Pacific Grove Museum of Natural History today for Science Saturday. This month’s event features one of Pacific Grove’s most loved animal, the Monarch butterfly! Kiddos can learn all about the butterfly’s metamorphoses, get their face painted and enjoy plenty of hands-on activities. 11am-3pm, 165 Forest Avenue, Pacific Grove. Free event. Aloha Radio makes a special stop at Big Sur’s Fernwood Tavern tonight. The SoCal surf band is sure to make waves! 9pm, 47200 Highway One, Big Sur. Free event.